Compared to AIXM 4.5, AIXM 5 enlarged the data scope in several areas. The main additional features that have been introduced are related to aerodrome mapping data, terminal procedure data and obstacle data. So what’s new. e) Instrument flight procedure data sets. The exact content of the data set will be specified in the PANS-AIM and the corresponding data catalogue (the first edition of PANS-AIM is expected to be published in 2017). Besides the terrain data set (which is not covered by AIXM), these are exactly the areas in which the AIXM 5 has been enhanced, compared to AIXM 4.5. This is the core data set containing the information that was already published in the AIPs in the past. In this area there are no significant differences between AIXM 4.5 and AIXM 5. AIXM 5 was extended by taking also into account Airport Mapping data in order to support the feed for Aerodrome Mapping Database (AMDB) applications. For this purpose the data requirements (elements) described in the industry standard EUROCAE ED-99A (RTCA DO-272A) “User Requirements for Aerodrome Mapping Information “were incorporated into AIXM 5. 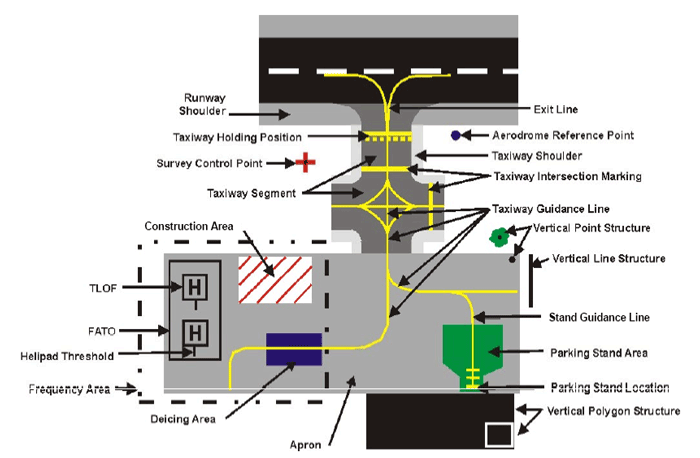 These additional elements are for example, movement area geometries runway/taxiway intersections and surface markings. 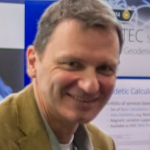 The corresponding mapping document between AIXM 5.1 and EUROCAE ED-99A can be found on the AIXM Wiki website. Note that in the meantime already a newer version of the standard has been published, viz. RTCA DO-272D/EUROCAE ED-99D, which will be taken into account by the next major version of AIXM. In AIXM 4.5 you find an entity called “Obstacle”. In AIXM 5, as the obstacle concept was extended the corresponding feature is named “Vertical Structure”. A justification might be that in AIXM 5 the VerticalStructure element is not only used for obstacles but also for other constructions that may not be considered as an obstacle for aviation. 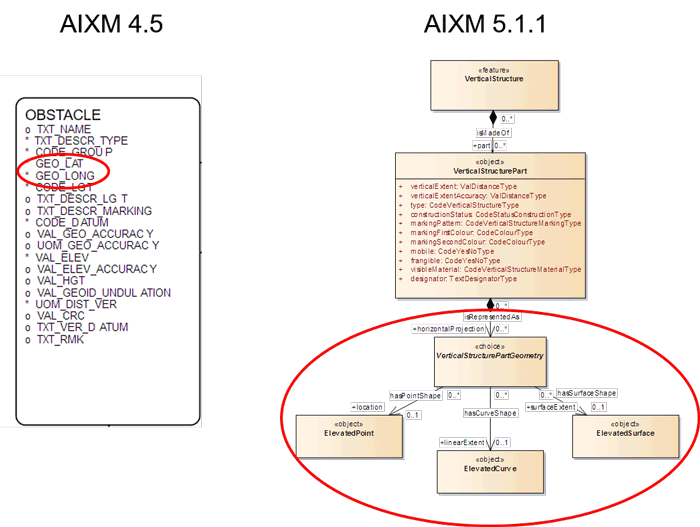 Compared to AIXM 4.5, with AIXM 5 it is possible to define the single parts an obstacle may be made of, using the VerticalStructurePart feature. Newly introduced was also the possibility to define which Obstacles belong to which Obstacle Area (Area 1-4). This fulfils the corresponding ICAO Annex 15 requirements. One of the major changes is that in AIXM 5 you can define the geometry of an obstacle as a point a line or a polygon, whereas in AIXM 4.5 you are limited to a simple point definition. 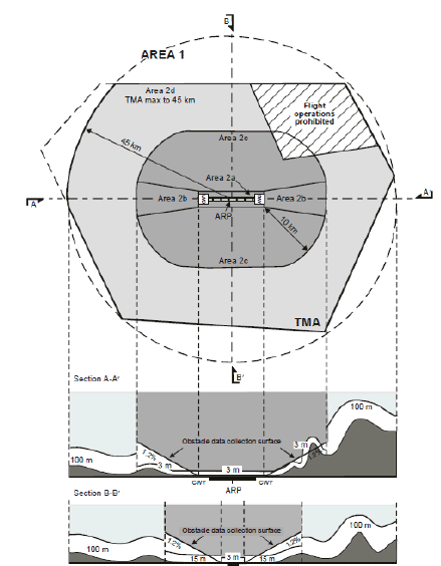 The terminal procedure part of the AIXM 5 model has been significantly revised. On major modification was the adoption in order to be able to encode PBN procedures, including new types of procedures such as LPV, LNAV/VNAV, etc. However, as the field of flight procedures is constantly developing, also AIXM will have to be constantly modified in this area (e.g. Point in Space procedures are not covered by AIXM and will be introduced with the future version AIXM 5.2). Another important change that took place with AIXM 5 was to provide the possibilities to encode terminal procedures from two different point of views. 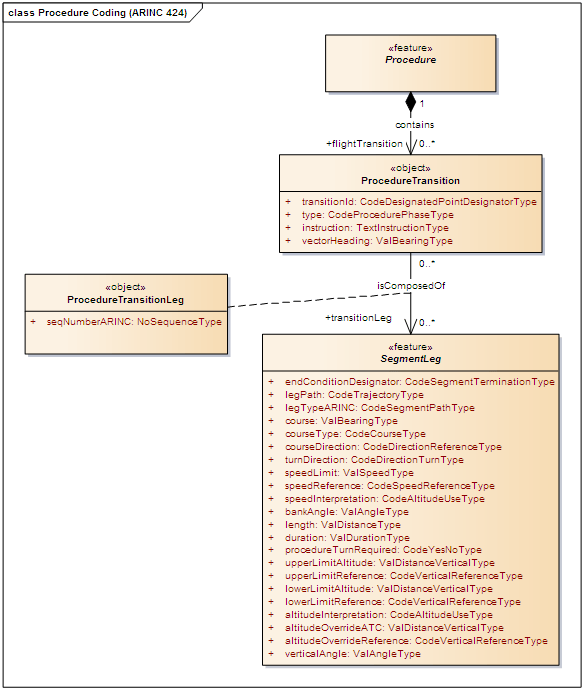 The procedure coding view and the procedure design view. AIXM 5 provides features to code terminal procedures applying the ARINC 424 specification including the full set of path terminators and supporting the transition concept. The ARINC 424 specifications is a standard for the preparation and transmission of data for assembly of airborne navigation system data bases used by the Flight Management Systems (FMS) of an aircraft. On the other hand AIXM 5 it also provides a set of features for procedure design specific data such as Surface Assessments, following ICAO PANS-OPS or TERPS criteria. PANS-OPS (Procedures for Air Navigation Services – aircraft Operations) are s set of rules and requirements for designing instrument procedures published by ICAO. TERPS (Terminal Instrument Procedures) are the US requirements and the standards for establishing instrument approaches. Procedures have to be designed first, ensuring obstacle clearance, before they are published as a chart used by the pilot or loaded into the computer system of an aircraft. AIXM 5 also included elements to model Aerial Refueling, i.e. prescribed pattern, established by air refueling points, along which air-to-air refueling of aircraft is performed. Also Surveillance data and can be encoded. Besides some other minor changes, new introduced was also the ability to model Seaport data. Although in the latter area there seems still to be some work done in the next AIXM version 5.2 in order to make that part of the model fit for use. 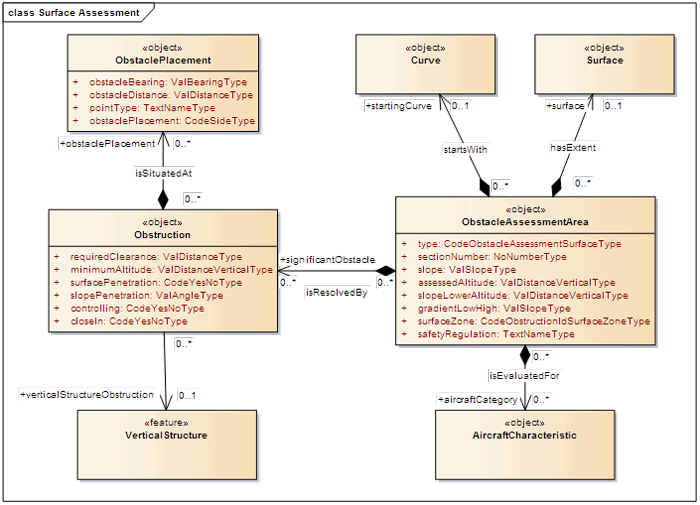 Whereas AIXM 4.5jsut covers static data elements, AIXM 5 covers both, static and dynamic data elements. This makes AIXM 5 an enabler for the digital NOTAM concept. A digital NOTAM can be defined as a data set that contains in a structured format, which can be fully interpreted by an automated system without human interpretation, the information currently distributed by text NOTAM messages. Information updates (both temporary and permanent) are merged with the information of longer duration, using the same data structures and distribution channels. Information provided as Digital NOTAM is suitable for automatic checks, which should ensure improved coherence and correctness. Digital aeronautical data also facilitates graphical representation of NOTAMs. The fictitious example below shows the closure of the Airport with the designator ENSO for one hour on the 15th of December 2018, an information that would be published by a NOTAM, encoded as digital NOTAM applying the AIXM 5 (simplified!). 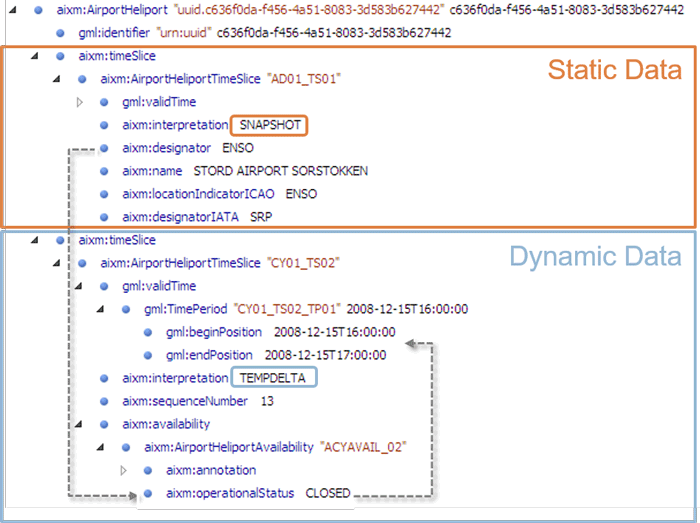 The example shows how the merge of dynamic and static data works in AIXM 5. Therefore a key element of the encoding is the AIXM 5 temporality concept. The dynamic part of the encoding, i.e. the change of the operational status to CLOSED for a defined time period is encoded as a TEMPDELTA timeslice. The reference to the static data, i.e. the date of the airport affected is encoded as SNAPSHOT timeslice. More about the AIXM Temporality Concept you can find in another corresponding blog entry or also have a look at the AIXM website there you will find a document describing this concept in detail. The European Organisation for Civil Aviation Equipment (EUROCAE) develops performance specifications and other technical guidance documents exclusively dedicated to the Aviation community in cooperation with the RTCA. EUROCAE documents are widely referenced as a means of compliance to European Technical Standard Orders and other regulatory documents.